This staged, one-act reading, based on a true story, is written and directed by Leslie Slape. It plays through this weekend at Stageworks Northwest Theatre at 1433 Commerce Ave. in Longview. For more information on this production and their season, go to www.stageworksnorthwest.org or call 360-636-4488. Shakespeare purported that we “…are made of sterner stuff.” In this, story, two men were forced, by circumstances, to prove just that. The first hanging in Washington State happened in 1892 in Cowlitz County. The man that was executed for murder was Robert Day, a farmer near the Lewis River. The victim was Clint Beebe, a local logger. This original drama by Ellen Margolis is produced by Playwrights West in conjunction with CoHo Productions. It is directed by Ryan Reilly and plays through August 31st. For more information go to their sites at www.playwrightswest.org or www.cohoproductions.org or call 503-715-1114. For the life of me, as much as I enjoyed the actors and the production values to this show, I could not discern an actual, coherent story line. Now the avant-garde movement from the 50’s would have embraced this show, without question. With such writers as Beckett and Pinter and Albee and shows like Waiting for Godot and The Birthday Party and Tiny Alice, this would have fit right in. And I happen to like these playwrights and welcome the ambiguous streams of consciousness type of writing, letting audiences discern meanings for themselves. Their plays do not have a linear flow, necessarily, and seem to take place in the mind or imagination. Such is the state of this play. Just when you think you’ve got a handle on a thread of a story, it switches to something else (perhaps like a jolt of electricity to your senses). And if you have an open, objective mind and like to deduce things, as a detective would, then this is your cup of java. As to try and give you any sort of synopsis, that may be a different story, but here goes…. It seems that Lucy (Rachel Rosenfeld) has had a fascination with electricity ever since she was a child, when capturing fireflies. It seems that her mom, Louise (Rebecca Toland) has gone a little, well, funny in the head and, as a result, has had to be institutionalized. Her treatment consists of shock therapy with electricity. 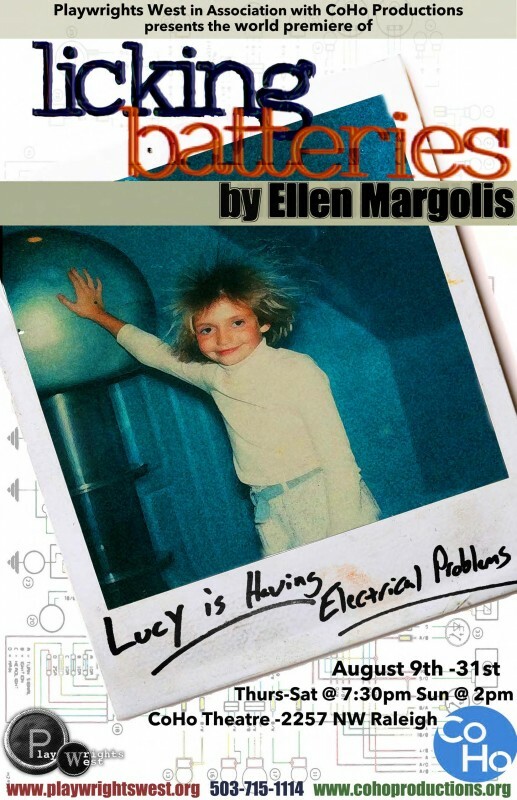 As a result, Lucy becomes a scientist, to discover the properties of electricity and, perhaps, how to cure her mother. Along her journey she acquires a roommate, Clare (Summer Olsson) as well as a boyfriend, Mark (Alex Kirby). But she is willing to abandon them all, as well as her loving, patient Dad (David Knell), in pursuit of her obsession to discover the source of electricity and, perhaps, life itself. In the end, her obsession floods her being and she is reduced (or transformed) to another state of awareness. Sound enticing? It is, but I also may be way off base and so, dear audience, it is up to you to discover the secrets of…licking batteries. As I mentioned, the cast is pretty exceptional, often playing more than one character and/or at different times of their lives. Rosenfeld is very special as an actor, playing the very complex, perhaps, disturbed, Lucy. This is an amazing performance. Toland, as her Mom, has the difficult task of sorting out who she is mentally, as well as her role as mother and wife. She does well. And Olsson and Kirby do nice turns as Lucy’s friend and lover. Both trying to be supportive but unable to understand her deeper struggles. And Knell is pure genius in the way he tackles the other male roles in the play. He is equally brilliant playing the understanding Dad; then, European lover; also, Louise’s eccentric doctor; and an old, Jewish man wanting to be struck by lightning, so he can join his partner in the afterlife. Not only does he act them to a tee but also, with minimum of make-up, is able to transform his appearance so that he also actually seems like another actor. A real tour-de-force! I don’t envy the director, Reilly, trying to manage the flow of the show but he does it well. A lot of credit must go to the scenic designer, too, Tal Sanders for creating such a fluid, organic set and props. The water/wave effect alone is worth the show! And some nice work by the lighting, music, and sound designers (J.D. Sandifer & Em Gustason), who enhance the production. I did enjoy Margolis’s work but feel it is only for discerning audiences. (Or, maybe, I’m just too dense to get it.) Personally, I like this kind of scribing that will force one to think and sense and discover, for themselves, the intricacies of the story. I do recommend this production but only for those willing to be challenged dramatically and mentally. If you do go, please tell them Dennis sent you. This play is one of the more familiar and oft-done plays of the Bard. It is also a very good example of why Shakespeare is considered so universal, as the plays often reflect our modern times, as well as human values. Compare the warring factions in Romeo and Juliet with the gangs of New York in West Side Story. Or, the battle of the sexes in The Taming of the Shrew with any number of television sit-coms. 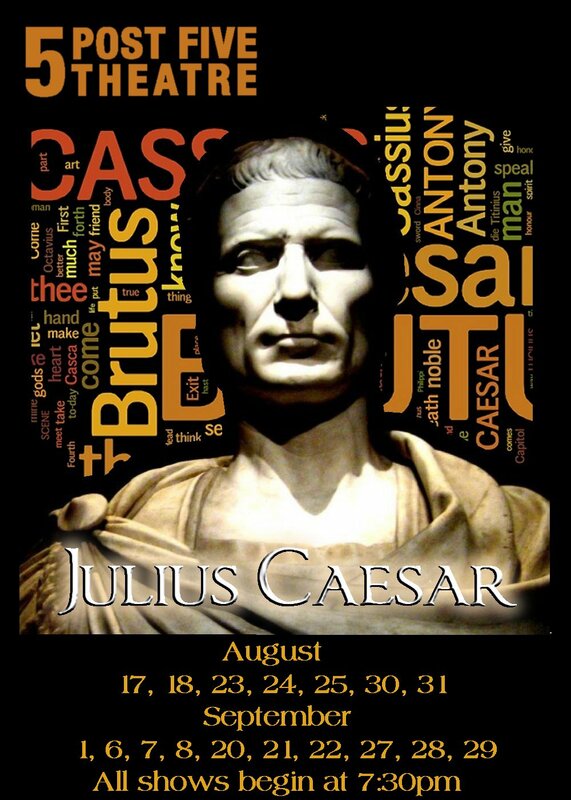 Or, Julius Caesar with many of the coups in the Mid-East or South America, or even our own, American Civil War. In other words, he was a writer for all ages. 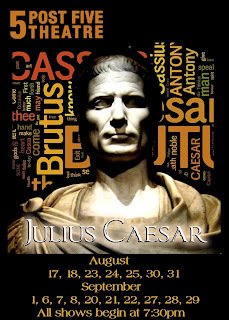 Julius Caesar (Michael Streeter) was a dictator, no doubt about that, but a benevolent one. “And, therein, lies the rub.” Should a man, however loved by the people, be granted total authority over a country? If so, what happens to the Republic, or the Senate? And, as the saying goes, “absolute power corrupts, absolutely.” Marc Antony (Heath Koerschgen), “…a limb of Caesar,” believes completely in his friend. But Cassius (Orion Bradshaw) foresees a way to win power for himself by enacting a military-type coup, claiming that Caesar was ambitious and has to be removed, assassinated. But Cassius is not himself well-liked and is too volatile and knows he must entrust his brother, Brutus (Paul Angelo), more popular and articulate then he, with the task of inciting the rebels. Brutus capitulates, but his reasons are more honorable than Cassius’s, as he is truly doing it for Rome, for the people. After Caesar’s murder, Antony persuades the conspirators to let him speak at his funeral and cleverly manipulates the crowd into turning against the assassins. And thus “…let slip the dogs of war.” In the fray, another relation to Caesar, Octavius (Andrew Bray), joins with Antony’s troops to hunt down the rebels and, thus, takes the throne for himself. Most of the foes are killed, some by their own hand, and control of the country is restored. It is interesting to note how often the supernatural is invoked in Shakespeare’s plays. They are teeming with spirits, fairies, witches, omens and in this play, Caesar’s avenging ghost and a soothsayer (Sam Dinkowitz), “beware the ides of March.” The citizens of Willy’s time seem to have a belief in the afterlife and, dramatically, these were used as effective devices of foreshadowing and to kick the plot forward when conventional means seem to fail. This production is done effectively on an essentially bare stage and in modern clothes, with masks when needed. The show does have a fair amount of blood and violence, when called for, and well handled. Boice certainly understands his subject and propels his cast forward at a break-neck pace. But he also has taken the time to invest each character and specific moments in the play with humanity and a dose of reality. Note when Portia (Verónika Núnez) gets really ticked at her husband, Brutus, she lapses into her own Latino, native tongue. Or when Casca (Ithica Tell) is asked to attend a dinner, she consults her calendar phone, et. al., nice touches. Angelo gives us a Brutus that is both honorable but vulnerable. A man you can care for but not necessarily follow. A somewhat gentler Brutus, which works. And Koerschgen shows a slyer, more manipulative Antony. This, too, works. One you might follow but not necessarily like. You see what I’m getting at. No clear villain or hero. But the acting kudos exploded with Bradshaw’s Cassius. He is clearly short-tempered, like a bulldog, and only Brutus’s handling of his leash, can keep him from killing everyone in sight. Orion, as always, enwraps himself in the mantle of the character and is utterly captivating and convincing as the conniving cohort to the confusion. The only problems arose were technical, as audience members near the speakers got too much volume, and some sitting on the sides claimed they had hard times hearing the actors when they were on the opposite sides of the stage. Guess one needs to get there early enough to sit in the center sections. And the attempt at audience participation, while a good idea, seemed only a minimum success. There is stylized violence in this play, so be warned. I recommend this production. If you do choose to see it, please tell them Dennis sent you. Meredith Willson’s terrific musical opened last night and will play through August 18th. It is directed by Kristi L. Foster, choreographed by Samantha Newhall and musical direction by James Pick. For further information go to www.journeytheater.org or call 360-750-8550. Gone are the days of ice cream socials, covered bridges, gas lamps, barbershop quartets, silent movies, horse-drawn carriages, and band concerts in the park. Soon, such things as libraries, book stores, movie theaters and post offices may follow suit. “Times are a-changin’” and, in my opinion, not necessarily for the better. Ray Bradbury and Rod Serling waxed poetic about the “good ole days.” So it’s grand to be transported for a couple hours plus, to a simpler era via The Music Man. This was Mr. Willson’s only great triumph on Broadway. His only other original musical, The Unsinkable Molly Brown, was a modest success. 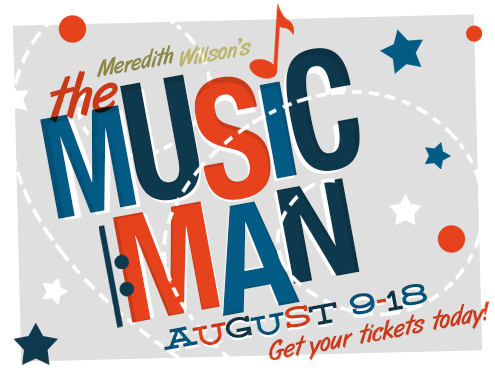 The Music Man made a huge star, both on Broadway and film, of Robert Preston. Matthew Broderick was in a rather weak TV version and Donald O’Connor even played it in Portland. With over 20 unforgettable songs and dances, a live orchestra and a cast of over 60, this is a real delight! The story is simple enough. A con man, Prof. Harold Hill (Chris Bartell), comes to a small Iowa town during the early 1900’s, intent on fleecing these simple rubes of their monies, and ends up being smitten and transformed himself. His con, to convince the townsfolk that they need a boy’s band to clean up the rough elements in their fair town of River City, Iowa. And, not knowing a lick of music himself, he introduces the Think System, in which you don’t have to practice music, all you have to do is think it and it will come out. But he doesn’t reckon on falling for the local librarian, Marion (Holly Counts). Nor does he anticipate the local Mayor Shinn (Dave Robinson) taking an instant dislike to him and suspecting him at the get-go of tomfoolery. And the townsfolk, stubborn and unwelcoming as they seem from the beginning, gradually warm up to his machinations and fall under his spell. But goodness will out and the darkness will be illuminated in the end. Willson’s songs and lyrics are extraordinary throughout. And this cast does it justice. The direction, by Foster, is nothing short of astounding, having to traffic more than sixty people onstage, many of them teens or younger, and having to coach believable performances out of them as well. And this is done with style to every person onstage, no matter the size of the part. Also, Pick and his musicians do justice to the tricky score. And, exemplary, is Newhall’s choreography. To have gathered so many people into dance numbers, many, I assume, not having any extensive training, is amazing. The numerous dance numbers are all very well executed, having the look of professionals. Also kudos must go to the costumer, Anne Dunlop, for clothing the large cast in appropriate period wear. There seemed to be some glitches in the set changes, lighting and miking at times but I’m sure this was just opening night flubs, that were minor, and will be corrected with practice. There is no doubt that Preston was the definitive Hill but Bartell creates his own stamp on the role. He is a somewhat gentler Hill but that makes it easier to believe that his character can change with just some subtle nudging. And he does fine in the singing and dancing departments, too, especially the difficult “Ya got Trouble” song and the rousing “76 Trombones.” And Counts, as Marian, is a singing sensation. Her operatic voice is a terrific asset to her songs, especially “My White Knight” (cut from the movie version). Really also loved the Barbershop Quartet (David Jacquet, Jeffrey A. McHenry, Tim Ackerman and Dean Waters). If they aren’t a foursome in real life, they should be. And the featured children, Aida Valentine (Amaryllis) and Josiah Bartell (Winthrop), were very appealing, especially Bartell, in his song, “Gary, Indiana.” A very winning performance. He is a star waiting to happen. The show is magic from a by-gone era. A time when people actually communicated in person with one another. A time of old-fashioned American values and forgotten lore. A nostalgic trip down memory lane, perhaps to refresh what we are made of, and for. Lest we forget…!